At long last Joe Buhdha presents the highly anticiated Klashnekoff album ‘Tussle With The Beast’. Does it live up to ‘Murda’ and ‘Focus Mode’? Find out what we think in this exclusive review. 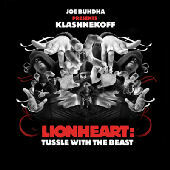 Highly anticipated by fans and hyped up enormously by Klashnekoff himself, ‘Lionheart: Tussle With The Beast’ has finally arrived, through Low Life Records and Rodney P’s Riddim Killa imprint. Produced entirely by Joe Buhdha, it’s a very exciting album, packed with potent lyrics from start to finish, lacing some of the most consistent and high quality productions UK rap has ever generated. The lyrical scope is impressive, from opener ‘The Revolution’ in which Klash calls for equality and criticizes his generation’s lack of social responsibility, to the introspective ‘My Life’, crew cut ‘Syonara’ and deeply personal ‘Rest Of Our Lives’, a sequel to his early hit ‘Black Rose’. ‘Terrorise The City’ features an impressive guest in Kool G Rap alongside Kyza, and provides a militant street flavoured jam of aggressive verses. ‘Question’ is a working bboy’s anthem whilst ‘Make Ps’ featuring Skriblah is a moving and reflective conclusion to the album. Whilst each individual track is enjoyable, with well structured concepts, a variety of sounds and tight vocal deliveries, there does at times feel like some pace is lacking. It would have been great to have a new ‘Murdah’ for 2007, showcasing Klashnekoff’s incredible ability to switch up his flow to cater for the more contemporary styles of UK rap. Also, in comparison to the recent Terra Firma and Kyza releases, a few more energetic efforts wouldn’t have gone amiss. Regardless, this will keep more traditional UK hiphop heads extremely happy, with both music and content of an international quality which is a lot more than can be said about most releases right now. Into your Grime or loyal to the old skool, this is worth checking out, simply for the event that it is alone. It’s been a long time in the making and has finally been released. Have a listen and see if it was worth the wait. Jury’s still out on this one. Like the review said, it’s disappointing not to have anything as full-bore as Murda or the Terra Firma numbers. Try putting on Murda after this album and the difference in energy is marked – I want to hear K-Lash roaring along at double, triple time like we know he can. It’s a good album, maybe great, (I’m not sure yet) but it does seem to lack that killer one or two tracks to fully close the deal.